If you are interested in circus arts and want to learn new skills, Bosnian Acrobatics Convention is a good choice. They offer workshops for people from all levels so you can choose the ones you want to attend. They have 25 different workshops during the week. All level accepted, two workshops in parallel in the morning and the afternoon with different techniques (icarian, banquine, handstands, portee, hand to hand etc) and free open workshops by the participants (you?!) 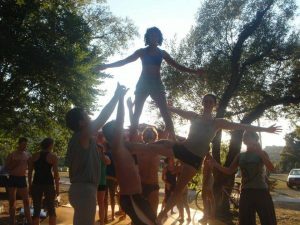 to share skills (tissue, trapeze, juggling, slackline…) possible! Come and join us, even if you are a beginner! Learn more about the Bosnian Acrobatics Convention.